Construction begins this summer to build the new, Joan and Sanford I. Weill Neurosciences Building at the UCSF Mission Bay campus. It will be one of the largest neuroscience buildings of its kind. During construction, shuttle service, parking options, and street and pedestrian traffic will be impacted. Contact: For specific questions related to parking at UCSF’s North Campus, please contact Mission Bay Campus Transportation Services at (415) 476-1511. Starting Jan. 22, 2018 - Beginning January 22, ALL shuttle stops along 4th Street in Mission Bay moved one block north to the covered areas of Rock Hall (west side of 4th Street) and UCSF Housing (east side of 4th Street). Shuttles are expected to operate from these new locations through Spring 2020. Ambassadors are on site to help navigate these changes. 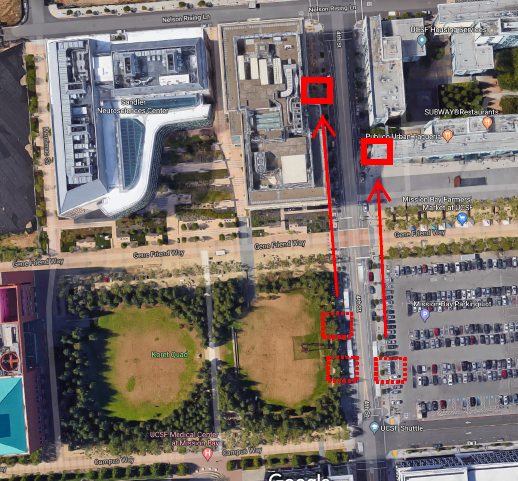 Features: UCSF shuttle stop on West side of 4th ( in front of Koret Quad) will move north in front of Rock Hall and the East side shuttle stop will also move north in front of the Housing complex (between Gene Friend Way and Nelson Rising Lane). What is happening to the Fourth Street parking lot? The current staff and visitor parking lot located on Fourth Street will close permanently in Summer 2017 to make way for construction of the new neuroscience building. Drivers looking to access North Campus will be redirected to the ample parking located at the Nelson Rising Lane Parking Lot 1, in North Campus. When and where is Nelson Rising Lane Parking Lot 1 opening? Scheduled to open in Summer 2017, this lot will be located in the North Campus at the corner of Owens Street and Nelson Rising Lane. To access the ample parking lot, a new pedestrian throughway at Nelson Rising Lane will connect Owens Street and Fourth Street. What are the features of the new Nelson Rising Lane Parking Lot 1 opening? The lot will have 275 parking spaces. Who can park in Nelson Rising Lane Parking Lot 1? Parking is available for all students, faculty, staff, and visitors visiting the Mission Bay campus. Please be advised that parking permits apply. Any visitors without a permit will have access to ticket machines, located near the entry and exit driveways of the parking lot. What will happen to the shuttle stops? Shuttle service will still be available during construction but the shuttle stop locations and routes may be modified for traffic and safety reasons. We will alert commuters of any shuttle stop changes, in advance.